Why did we never put our nerdy toys away? Sometimes people are walking contradictions and nerds are no different. We are a generation of people who never put their toys away. We have figurines on our desks at work, posters in our office, and bumper stickers on our cars. But sometimes we hide our nerdiness. We are out and proud but at the same time don't always broadcast it unless someone asks us. 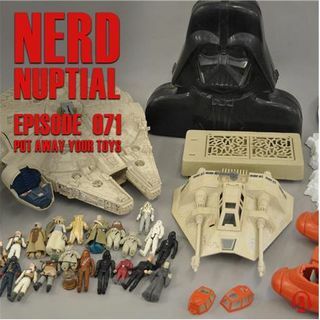 In this week's episode, The Girl and Tristan discuss what it was like growing up as a ... See More nerd and what kind of merchandise we had as children. We also talk about how that translates to today and what is socially acceptable to display and what is not. Are you out and proud or are you still in the nerd closet with some people?